Cleaning-related gifts can be dicey to give, but if what you really want in life is a fancy vacuum there’s no shame in that! Which is why cleaning-related self-gifting can be so satisfying. 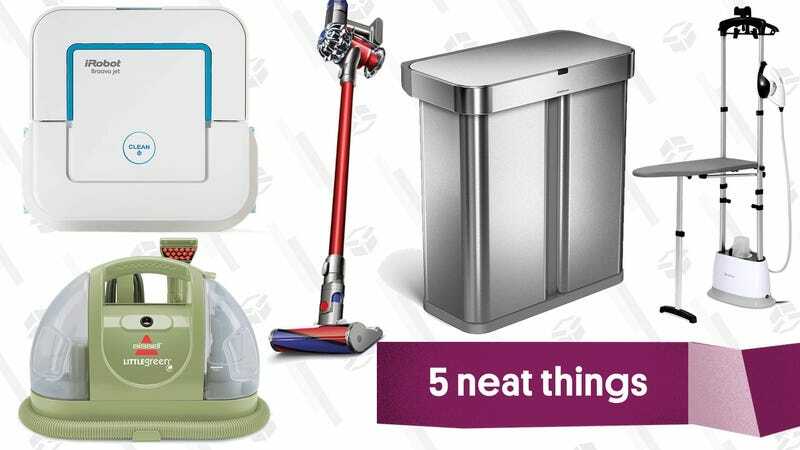 Whether you want to take advantage of seasonal sales, or you’ve got a gift card burning a hole in your pocket, these are 5 big ticket housekeeping items you might consider treating yourself to. If you have pets, or kids, or a spill-prone housemate, a carpet and upholstery cleaning machine is such a great investment. The thing that these types of machines do that can’t be replicated with manual cleaning is that they force cleaning solution down into the fibers of upholstered furniture, carpeting and mattresses and then extract it back out, which helps to penetrate deeper into the fabric and also doesn’t leave behind a sopping wet mess. These types of machines come in different sizes and different price points—from cordless handhelds to full-sized upright models—but the Little Green Machine is a mid-sized and -priced option that will serve you well. 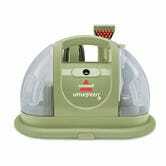 There are more powerful vacuums, and less expensive ones, but this vacuum is life-changing. Here’s why: There’s one thing this cordless, stick-style vacuum has over similar models is a wall-mounted charging dock. That may not sound like much! But it is everything. Because the hardest thing about vacuuming is getting the vacuum out. (Think about it.) Being able to quickly grab and put away a vacuum means you’ll use it. Hey you know how to get the most out of a vacuum?!? Using it. Get this vacuum. Change your life. Say you’re interested in owning a robot that will clean your home. Sure! Plenty of people love that idea, and most of them opt for a robot vacuum, like the Roomba or a lower-priced model from Anker or Ecovacs. 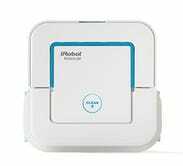 But the best robot for cleaning is actually the iRobot Braava. It’s a mopping robot! The Braava actually performs three different mopping functions, depending on which disposable cleaning pad is inserted into the machine — wet, damp and dry. The dry pads are akin to a Swiffer and are perfect for picking up hair, dust and dirt; the damp pads are perfect for regular cleaning, which is a thing you can do since you don’t actually have to do it because robot mop, and the wet pads are for when you need a deeper clean. 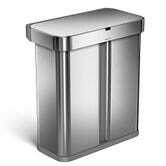 Do you need a $250 trash can? No. Might you fully covet a $250 trash can? Yes. This trash can does everything except bring the bags to the curb for you. You want the lid to open? Say “open can” and it will open. Is talking to a trash can too much to ask? Waving your hand in front of it will open sesame for you. It’s got two compartments, so you can manage your trash and recycling without needing separate bins, a rim that flips down to secure the liner so that it doesn’t go slipping out of place, and a clear coat that keeps fingerprints from ruining the look of the stainless steel exterior. Travel steamers are great, but when you’re ready to level up with your garment care, this full sized steamer set up is the way to go. 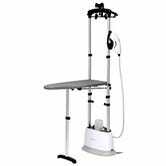 The thing that sets it apart from other full sized steamers is that its stand includes a flip-down ironing board, and the steamer’s faceplate converts to a mini iron for detail work like pressing shirt collars and trouser creases.